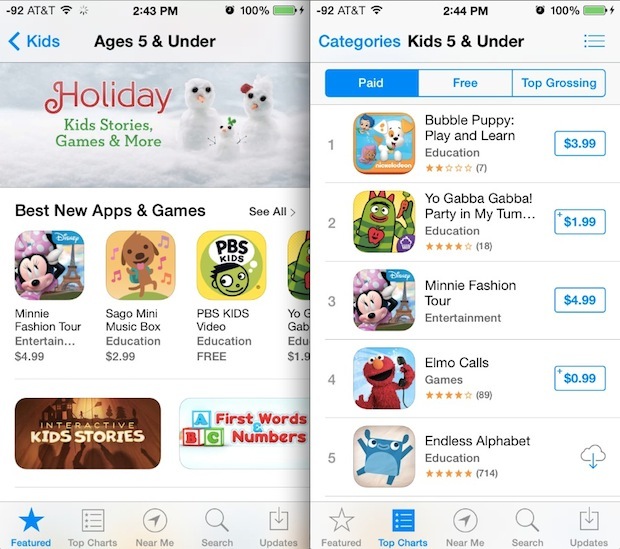 Apple has created individual sections of the App Store for kids, which makes finding age appropriate apps for children much easier than it was before. With a few adjustments, you can basically create a kids-only App Store, perfectly suited for children aged 11 and under, but also conveniently broken into different age groups if you’re looking to narrow down to more age appropriate choices. 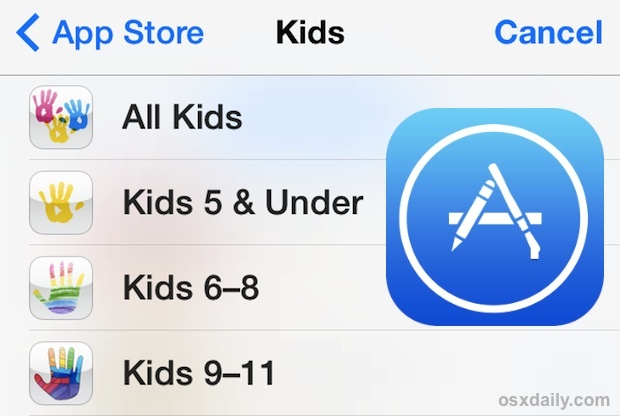 This is different from the general age restrictions that can be set for the App Store, and aims to provide an easy way to browse through the huge amount of kids apps available to iOS. The two tricks we’ll focus on below usually feature the highest quality apps chosen by Apple in the Features section, and also show you waht’s most popular as determined by other user downloads and purchases. 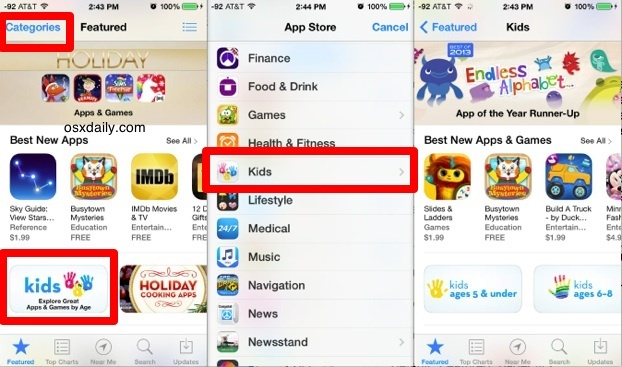 The Featured Kids apps section is usually great, having apps that have been selected and filtered by Apple’s App Store moderators to show high quality engaging apps for the appropriate age ranges. It can also be helpful to check out the top apps for kids though, and that’s what we’ll cover next. The Paid and Free sections are worthwhile and have lots of great apps which can be great for kids of all ages. Meanwhile, the “Top Grossing” section sometimes has a few good ones, but overall is pretty useless for sorting apps of any kind, it’s usually just a list of apps with tons of required in-app purchases. Frankly, I’m not quite sure why Apple bothers to show ‘Top Grossing’ anywhere in the App Store other than to demonstrate to developers what (annoying) app model works to create a cash cow… but I digress. You’ll notice that entering into the “Kids” section of the App Store is pretty easy to leave, entering into the broader range of apps for all age ranges. If you’d like to restrict the App Store for a certain age range, use the Restrictions settings as Parental Controls to lock down what apps and media can be used on the device, where you are able to set specifics about what type of material can be downloaded onto the iOS device. 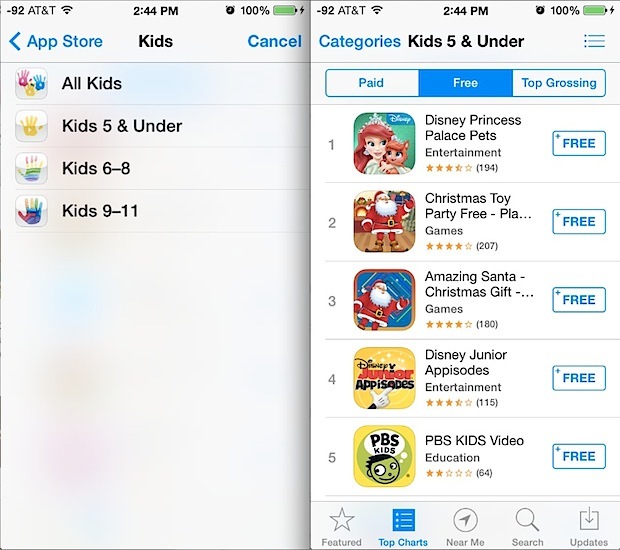 Quick side note: parents and adults should remember to disable in-app purchases (IAP) in iOS Settings before giving any iPhone/iPad/iPod to any child, even if you only plan on downloading ‘free’ apps for the kid(s). You can always go through and change it if necessary, but disabling it ahead of time can prevent huge charges from being accidentally racked up by the little ones. Even if the kid has an iTunes Allowance configured for use, it is still recommended to turn off IAP because some developers are borderline predatory in how they lure and disguise the purchases. Our advice; don’t take the chance until you know for sure, just disable the purchases and avoid any headaches. Heads up to CultOfMac for the reminder about this, don’t forget you can use the same sorting on the desktop with iTunes and the Mac App Store too! This is only a partial solution though. What I really don’t understand is why the language of an app is not available as a search criteria. But of your kids are not speaking english natively, it is really difficult to find apps suitable for your child. Just try to find an app for a six year old that is playable in German.